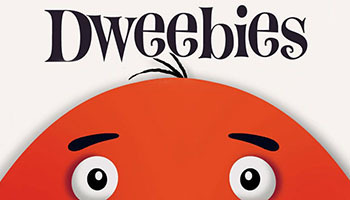 Meet the Dweebies! These uniquely colorful characters are out to capture your heart, but you must capture them first! Round up Dweebies by matching cards on both ends of any row. Seems simple at first... but Dweebies can be tricky, and some will disappear before they've met their match! Collect the most cards and consider yourself the Dweebie-in-Chief! Collect the most cards by matching Dweebies on both ends of any line in play. 1. Shuffle the deck and deal each player a hand of five face down cards. Look at your cards but keep them secret from your opponents. Note that the number of dots under the Dweebie in the top left and bottom right corners indicates how many times the Dweebie appears in the deck.